Both victims were in a serious but stable condition after the attacks on Friday night. A taxi driver was left seriously injured after being attacked with a knife by a passenger who drove off in his car. The attack on the 44-year-old driver happened shortly before a 68-year-old woman suffered a knife attack in Duke's Road in Cambuslang, South Lanarkshire. Police Scotland said the attack on the driver happened at around 7.50pm on Friday in the town's Eastfield Avenue, and left him with injuries to his neck. The driver left the taxi and the suspect made off in the car, which he later abandoned in Morar Drive. The 68-year-old woman suffered injuries to her chest in the attack, police said. Both victims were taken to Hairmyres Hospital in East Kilbride, South Lanarkshire where medics say their condition is serious but stable. 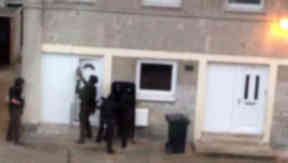 After the attacks armed police were seen carrying out a raid on a property in the town. A video showed a group of armed officers using a battering ram to break through the door of a flat. Police said a 33-year-old man was taken to Glasgow Victoria Infirmary, where he has been detained in a stable condition. Police say they are are not looking for anyone else in connection with the incident.